I'm right in the middle of final exams, so I haven't been blogging too much! I just had my first two exams today, and I think they both went quite well :) I'm finished exams on Dec. 19th, and I cannot wait to just relax! Now I'm normally a shower gel kind of girl, but I do make exceptions for Lush's soaps. Lush included a few limited edition soaps in their holiday collection this year, including North Pole soap*. What's really interesting about this soap is that it comes in two versions: white and pink. I have the pink version, but I haven't tried or smelt the white one. "A spectacular seasonal soap with the scent of sticky, chewy cocoa absolute and peppermint in the pink part and the refreshing oils of cedarwood and cypress in the white. It's a brilliant balance of stimulating, refreshing lathers, with just a hint of luxurious, indulgent sweetness." If you buy this in stores, you can of course ask for either the white or pink parts, or both. But, if you order online, you will be sent one at random! I love Lush's soaps because they lather up so nicely, and the scent just fills up your shower. These are hand made, as all Lush products are, and I think they make such a nice gift or stocking stuffer idea. 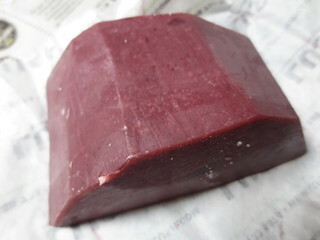 North Pole lathers up in the same colour as the bar, a really nice deep purply pink. For some reason this really excites me, it's so fun! 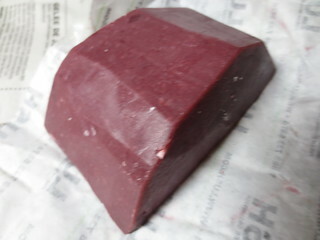 This soap is also quite moisturizing, which is another reason why I love Lush's soaps. They won't leave your skin feeling dry or tight like a lot of soaps do that you find at the drug store. The pink part of North Pole smells like peppermint and cocoa, which makes is such a wonderful soap to use around the holidays! Very festive :) I adore the scent, and I wish that it lasted longer on my skin. As with any soap, make sure to store these out of the stream of water so they don't melt away! North Pole Soap is $6.95/100g, and you can ask for any size bar while in a store! I might have to take a trip out to a Lush store to take a sniff of the white version, it also sounds delicious :) Have you picked up any of Lush's holiday items? Which ones are your favourites? That soap sounds delicious! I'll have a look next time I drop by Lush. My exams end the 20th! Good luck on yours, it's almost over! We'll be done exams before you know it :) Best of luck with yours! Good luck on the rest of your exams! this soap sounds so awesome! It is pretty great, give it a sniff if you get to a Lush before Christmas!